who would’ve thought a glittery rhinoceros menorah could be so beautiful? Too…much…can’t process…the redonk. Hahahaha! 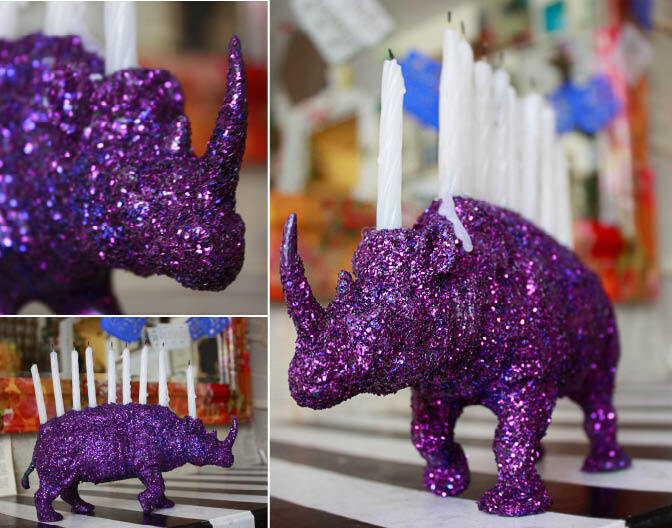 The rhino is the most hip-crazy-freak of a menorah I’ve ever seen, and I want one! Can’t believe the super simple technique for this, you are so good at the brilliantly easy thing. Good taste is highly over-rated! I’m into chintz and glitter myself. Your menorahs are too much fun!! Question, Aunt peaches: is it offensive for non Jewish people to keep a menorah in their home? I think they are beautiful but I don’t want to offend anyone. you seem pretty open about stuff so I thought I would ask. Please forgive me if it’s a rude question, i just always wanted to know. Thank you for making me smile as your post appeared. It definitely was not what I expected. The rhino is great by itself but when coupled with the elephant — I’m speechless. thanks again, I love it. Good question Kelly! Hmmm….I am hesitant to answer because I am not an authority on the matter, but I’ll tell you what I know, take it or leave it. 2. My friend also claims computers are radioactive and will fry your brains from the inside out. And because I am confident she is not reading this, I will tell you: my friend is full of crap. And, I might add, just because you have a menorah does not mean you are worshiping one, just as you will find that not everyone who owns a Bible is a Christian who follows the gospel. There are lessons to be learned and common ground to be discovered. These are good things. So what if someone is offended? Is their opinion more valuable than all you have to gain? Look, I’m not trying to convert anyone (believe me on that one!) but there is a whole lot of cool stuff about menorahs besides the fact that they are beautiful. 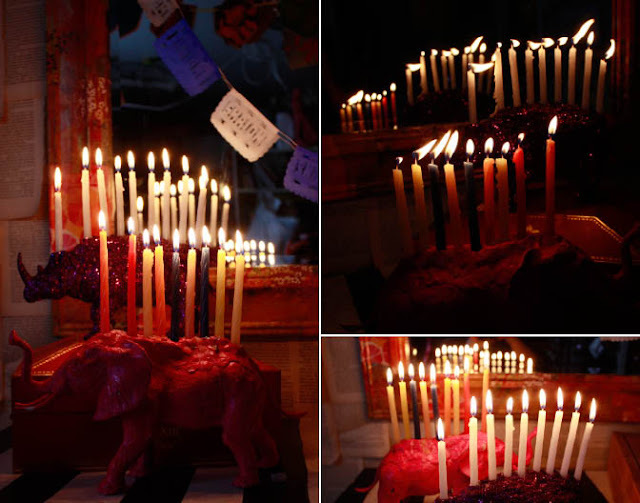 Channukah isn’t just ‘the festival of lights’ –it’s a story of endurance. It’s about people who survived a horrific act of violence and humiliation, only to rebuild their community with little more than love, compassion, and candlelight. That story reaches far beyond Judaism…turn on the nightly news and you will see that story repeating itself over and over…families destroyed by violence or circumstance, putting themselves together again. So, all that is to say, Channukah is a lot like like Humpty Dumpty. But with candles. And religion. And multiple spellings. Well said. These things should be talked about more often. I’m catching up on my blog reading and came across this. You have made my year. I wish we were neighbors so I could sneak over after my kids go to bed and sample whatever kind of punch you are drinking. Holy menorah! 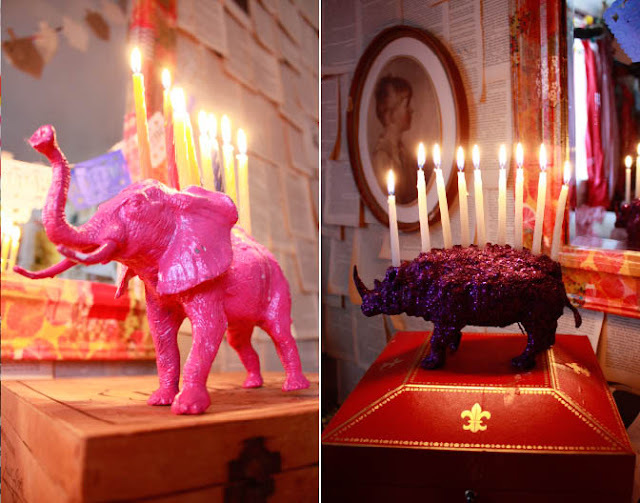 I love the pink elephant. But I love all of your stuff! Love this!!! I made one last week for a friend of mine. Here’s a post if you want to see how it turned out!!! Just saw the ‘Bullpotamus’ pic and thought I would die from laughing so hard! Love it! LOVE THIS! Just want to mention that Hanukah candles are supposed to be left to burn until they extinguish themselves (not blown out). Obviously, they should NOT be left to burn all the way down on a menorah like this, particularly if you use Model Magic to hold your candles, because I believe it is flammable when dry. You might be able to get away with it with air-dry terracotta type clay as this is generally not flammable. love, love, love! 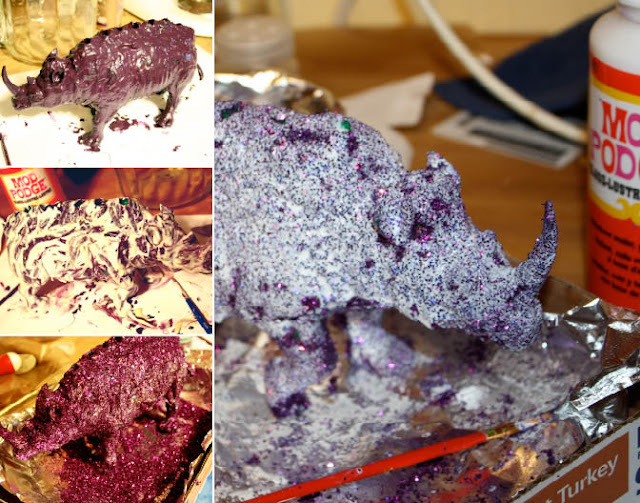 the glitterfest continues, thank you! Any ideas where I could find these kinds of animals? I would love to do this project but am only finding very expensive. Stores or website recommendations are very welcome! I find mine at Dollar Tree. They carry animals of all sizes at Michael’s in the kid section – I have seen as little as $7, but if you want one that is more, time your visit to when they have 40% coupons (pretty much every other week at this time of the year). Good luck!